Delilah Montoya is a contemporary artist and educator who was born in Fort Worth, Texas and was raised in Omaha, Nebraska by her Anglo-American father and Latina mother. She earned her BA, MA and MFA from the University of New Mexico. Her art is noted for its exploration of Chicana identity and for innovative printmaking and photographic processes. She is also noted for her use of mixed-media installations and often incorporates iconic religious symbols in her pieces. Montoya divides her time between Albuquerque and Houston. She taught at the University of New Mexico, Institute of American Indian Arts and California State University before accepting her current position at the University of Houston. RR: Delilah, what an honor. How are you? DM: Oh the honor is mine thank you for taking time to talk with me. Currently I am very active with exhibitions and cultural work. I am organizing Latinx artists in Houston for the Spring of Latino Art 2019. It is a first time event and the city has responded positively to the idea. I am so proud to bring the Women Boxer: The New Warriors that was exhibited at MoMA PS1’s Body Armor to PDNB in Dallas that opens Saturday, November 17th, 2018 from 5 - 8 PM. PDNB Gallery is located at 154 Glass St, Ste 104 Dallas, TX 75207. The other exhibition I am working on is Contemporary Casta Portraiture: Nuestra “Calidad” to open in February at Centro de Artes, San Antonio TX. Also as part of Sin Huellas collective we installed another iteration of Detention Nation at TTU Landmark Gallery in Lubbock. During February another Sin Huellas action in conjunction with HIGH LINE NETWORK JOINT ART INITIATIVE will be presented along Buffalo Bayou in Houston and later to travel to Chicago, Austin, Toronto and New York. This is a very busy but exciting time for me. RR: You are doing a lot of important work. For those that don’t know, could you talk alittle about the photographic content and topics you pursue and have pursuit in the past? DM: I am a self-identified Chicana photographer, printmaker, and installation artist, working and living in New Mexico and Texas who takes on topics such as Malcriadas, Sagrado Corazones and Mexican Casta Paintings. My projects investigate cultural phenomena, always addressing and often confronting viewers' assumptions. 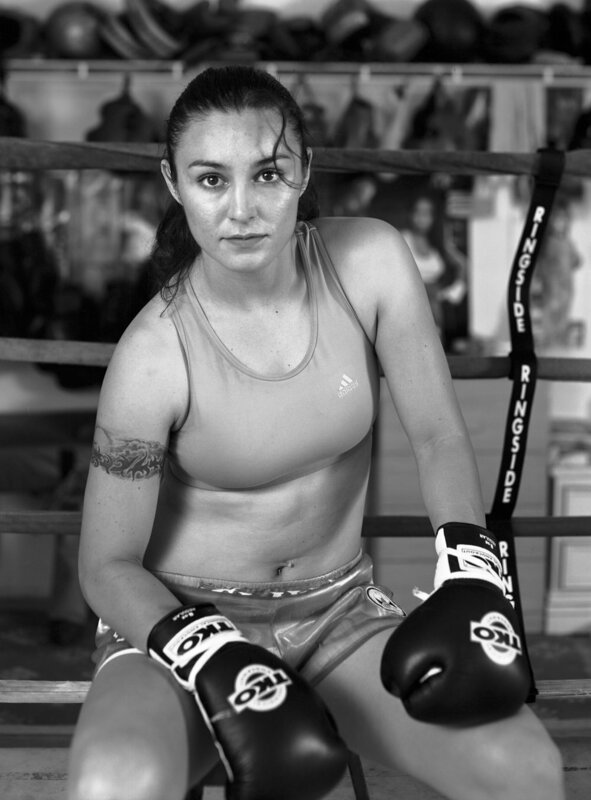 Women Boxers: The New Warriors, a book project featuring a collection of portraits is such a project. The work was first exhibited during Fotofest 2006 at Project Row House, and later it traveled to Los Angeles, Santa Fe and Dallas where Charles Dee Mitchell reviewed it for Art in America. More recently the series was featured at PS1 in the exhibition Body Amor 2018 curated by Jocelyn Miller. My work has traveled with the International Center for Photography exhibition "Only Skin Deep: Changing Visions of the American Self" and "Arte Latino: Treasures from the Smithsonian American Art Museum." RR: Today we’re talking specifically about that photographic series, Women Boxers: A New Warrior. You’ve often described the women in these images as malcriadas, which is a typical spanish term for someone who is particularly “ill-mannered”. What does this term mean to you and what does it mean for the work? DH: A lot of my work is about looking at the world around me. After I produced El Sagrado Corazón and the Guadalupe Tattoo series, my interest turned to the idea of the bad girl, Las Malcriadas. At first I thought, “Who are the bad girls?” And then I decided to look at the folklore tradition, it was so much fun, and there’s so many layers. After exploring the mythical bad girls, I looked for them in the real life. Asking my self “Who are our contemporary bad girls?” And realized the bad girl isn’t all bad. She thinks she is taking the right track, but the rest of the world is looking at it entirely differently. When a willful little girl decides that she is going to be doing it her way and not the way that they’re trying to teach her, she gets that bad girl label. The female boxer as a malcriada was the perfect fit. I decided to collaborate with Teresa Marquez in Albuquerque, who was doing research on female boxers. I enjoy collaborating as a way of expressing the voice of a community; it helps to expand a voice, so it’s no longer just my voice but it becomes more of “us.” You can’t be the single voice of a culture. And a collaborator offers other angles; you learn more, the work expands. I had this preconceived stereotypical idea that the boxers would be barrio Latinos or minority women. That’s not the case. It is international and goes across race. They are women who learn how to box, and deliver a pretty good fight. More than that, they are athletes, who are interested in combat. It was clear that the training is extremely rigorous, and it is a demanding sport. As a society, we’re still not comfortable with a woman who is inclined toward that kind of activity. These women are muscular, they’re tough, they train like crazy and they hit people for a living! Just as women boxers have to be able to deliver a punch, they have to take those punches. It’s a mindset that I don’t have, but it fascinated me. For men, boxing has been sanctioned specifically for them. Men can get into the ring, they can train and their father’s get proud of them. In contrast, the female boxers moves away from the social order to reinvent them. RR: Are there any particular stories that came out of this work? RR: As you mentioned the work was recently at MoMA PS1 as part of the exhibition Body Armor, which was a show consisting of all women. Could you describe the significance of your work in relation to the themes around the exhibition? DM: Women Boxers: The New Warrior was presented along with three other artists in Body Armor—Maryam Hoseini, Zadie Xa, and Ana Pellicer during the summer of 2018. The exhibition was organized to present an approach to bodily adornment placing a focus on the garments and objects worn to signal belongings, confer status, and project strength. To demonstrate how these markers are used to move fluidly through identity as instruments operating as social influences riding on existing hierarchies and stereotypes. Body Armor pushed the boundaries of how femininity is constructed across cultures, geographies, and generations, each of the artist trace the various ways these symbols work in public and private space to define features of our cultural life, sense of self, social rankings, and communities. As such Women boxers wear a specific look determined by the boxing industry. More importantly they are metaphorically reformatting the bastions of manliness. By crossing the ropes and getting into the ring, these professional athletes enter to confront a brutal sport. Female boxers fight because they can – they are professionally trained to participate in this sanctioned combat. This act and their accompanying gear made this series the perfect fit for the exhibition Body Armor. ﻿RR: I know that you’re work is primarily made around the southwest region and states of the U.S; Arizona, New Mexico and the Texas-Mexico border. How does this region inform your approach to photography and what you pursue? Even though I was born in Ft Worth and raised in the Midwest, my longtime place of residence is New Mexico, the ancestral home of my mother’s family. Much of my work is grounded in the mestizo/a experience of the Southwest and borderlands that brings together a multiplicity of syncretic forms and practices from those of Aztec, Mexico and Spain, to cross-bordered vernacular traditions, all of which are inflected by contemporary Native American and Anglo American customs and values. My artistic home is the combination of this contemporary world. As an activist artist, I pose questions to myself about identity, power, land, borders, gender, community, family and then explore this through an art practice; one that is generally based in series that tell specific stories pointing to larger experiences. I am an investigator of histories and lives; my primary subject is the human condition through time and territory as expressed through the lens of being a mestiza, a Chicana, someone who claims a hybrid identity and place both in terms of lineage and culture - this has been a lifetime project. RR: Thank you so much Delilah. I look forward to seeing your work in Dallas this month and the continuation of Sin Huellas and its efforts. DH: You’re welcome and so happy to be part of Deep Red Press. Please do stop by Photos Do Not Bend to have a look of the show.